Don't let the name fool you, Lady Gouldians can be males too. I'm not sure when Gouldian Finches (Chloebia gouldiae) started being known as Lady Gouldian finches. They are also commonly referred to as Natures Jewels, Rainbow finch, and Gould. 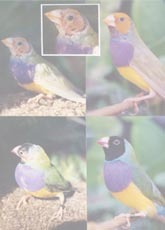 In reality, they are simply Gouldian finches. 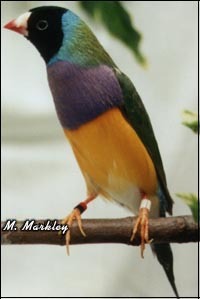 The name Gouldian was given to them by John Gould in memory of his late wife. Gouldians are native to Australia and natural inhabitants of the grasslands. Like most grass finches they enjoy space to fly, lots of seed, and places to hide. All are very important to remember if you plan to breed them. Gouldians are extremely colorful little birds, with some of the boldest and brightest coloring of any bird you can find at your local pet store. Gouldians have become move available and at a more reasonable price to the general public of the past 20 years. Gouldians that used to cost $100 each are now only $50 each which has helped their popularity to soar. Owning a Gouldian in either a cage or an aviary is fairly simple. They aren't high maintenance birds like some of the other exotic finch's available today. However they do benefit from constant temperatures and humidities and a stress free life. When buying a Gouldian or any finch, remember that you are not only bringing the finch into your life. You're bringing your home into your finch's life. Diet is the same as most grass finch species; a good seed mix, millet, greens, and clean water. 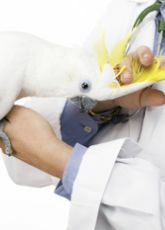 A little rice, veggies, cuttlebone, and eggfood can also go a long ways in keeping your Gouldians in good health. Housing isn't much a problem either. Adequate space for flight and maybe a swing are always important. Gouldians can get over weight if they aren't given enough space to move around and exercise. Different sized perches or tree branch type perches help keep your finches feet healthy. Like many other species of finches, Gouldian sexes look different. Females will be overall duller in color especially in the breast area. Also the blue ring around the head of the males will be brighter and thicker than the females. Most importantly the males sing (A soft whistle) and the females will lay eggs when their beaks change colors. Breeding Gouldian finches isn't as easy as others like Zebras and Society finches. They aren't always as quick or ready to breed. They only breed if they feel completely comfortable, they will only breed when the female is ready. Putting two Gouldians together and expecting babies is unreasonable and not likely going to happen right away. The male may sing and dance and the female will often respond favorably but she wont lay eggs until her beak has turned black (dark grey). Even after the eggs are laid and if the pair incubate them properly, Gouldians are known chick tossers which usually results in the death of all the young. Some Gouldians will learn to care for the young themselves and others never seem to get it right. This is when many Gouldian breeders will invest in Society finches to act as foster parents for their Gouldian babies. 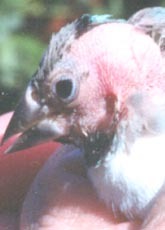 Society finches are natural parent birds. They'll sit on an feed just about anything, not only Gouldians but other finch species as well. While fostering isn't looked upon favorably by everyone, it is an option. 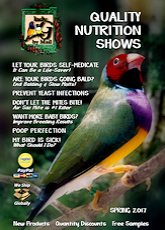 Fostering can lead to the over breeding of your Gouldian finches and this must not be allowed to happen. When the Gouldian eggs are removed and put into foster care, the pair will often lay more eggs right away. The Gouldians nest must be removed and the pair allowed to rest. No more than three clutches a year is recommended. 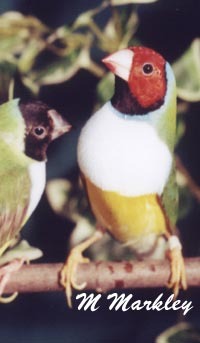 All baby Gouldian finches are a drab olive or dark green color. They will not develop the adult colors until they are around 4 months old. Over the years we've seen many new Gouldian color mutations appear from careful and selective breeding programs. At one time all Gouldians were green with red or black heads, now we truly have a rainbow of colors available to us in almost any configuration.